UAlbany Unveils "The World Within Reach"
ALBANY, N.Y. (April 14, 2008) -- Today, the University at Albany launched its first-ever branding initiative with the theme, "The World Within Reach." It showcases the University's distinctive qualities as a leading public research university that offers students a strong foundation for success and a broad world view. Today's announcement is the culmination of a year-long initiative which began last spring, when the University set out to examine how UAlbany was perceived both by the campus community and the public. The University partnered with the higher education marketing firm Stamats, assembled a core marketing team, and sought the input of faculty, students, staff, alumni, prospective students, high school guidance counselors, and community and business leaders to conduct a comprehensive analysis of its identity. The mission was to build a strong and consistent reputation based upon attributes that the University could demonstrate and stand behind. The goal is to better position the University in attracting and recruiting top students, first-tier faculty and administrative staff, and the necessary resources to sustain UAlbany's tradition of excellence. "In all our work, we noticed a recurring theme -- UAlbany as a place of opportunity and success," said Interim President George M. Philip. "Today, we unveil a campaign that captures and highlights the notable strengths that make UAlbany great and distinctive." "The World Within Reach" theme will appear in University publications, on the University Web site, and in other broadcast and outreach materials created by the University. UAlbany also unveiled today a new advertising campaign that will initially appear in the Capital Region, including the Albany-Rensselaer Train Station and Albany International Airport. Strategic Location -- UAlbany is a hub for new ideas. Its location in New York's capital has driven many of its distinctive academic strengths in such areas as public policy, criminal justice, social welfare, education, public health, and, most recently, nanosciences. UAlbany students have access to enviable internship and public service opportunities, employer connections that lead to jobs after graduation, and all the culture, recreation and entertainment of the region. Modern Vision -- The University's educational mission is straightforward: expand the worldview of its students and prepare them to make meaningful and lasting contributions to their communities, their nation, and their world. This far-reaching vision manifests itself on campus in the richness and variety of the University’s academic programming and the vibrancy of its cultural diversity. Life-Enhancing Research and Scholarship -- Through its research and scholarship, UAlbany contributes tremendously to the public good. The biological roots of diseases, the dynamics of hurricanes, immigration, cyberterrorism, and nanotechnology are just a few of the issues being tackled by UAlbany researchers. UAlbany research is advancing knowledge, driving economic growth in the region and state, and creating extraordinary opportunities for students. 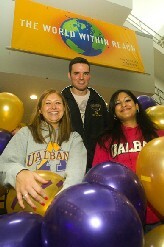 Diversity that Enriches Learning -- UAlbany is the ideal place to get a global perspective. Student and faculty come from more than 100 countries, bringing different and fresh perspectives. This breadth of diversity adds rich texture to the learning that takes place on campus and prepares UAlbany students to become world citizens in today’s interconnected global society. Excellence at a Great Value -- The excellence of a UAlbany education is recognized by many independent sources, such as the rankings published this month by U.S. News and World Report. Its great value comes in the world of opportunities available to students at an affordable price. Students learn from and are mentored by accomplished faculty. UAlbany offers 189 undergraduate, master’s and doctoral degree programs, an Honors College, championship Division I athletics, and a rich array of campus activities. Students form lasting connections with peers, professors, and alumni, and when they graduate, they join a global alumni network of more than 140,000. "By the time they graduate, our students have what it takes to contribute and succeed in many fields. In countless ways, UAlbany has put the world within reach for them," said Susan Phillips, Interim Provost and Vice President of Academic Affairs. "UAlbany has played an important role in my life as a professional and as a person, helping me attain a position where I could be of greater benefit to my community," said David Brown, '05, President and CEO of the Capital District YMCA. "UAlbany has been at the forefront in developing research partnerships across the globe," said Sanjay Goel, Associate Professor in the School of Business and Director of Research at the Center for Information Forensics and Assurance. "Through UAlbany, professors like me have made contacts with top international researchers, leading to mutual engagement on critical issues and creating the potential for increased networking and cooperative efforts." "I have received a great education with excellent faculty, made wonderful connections, and have had countless experiences that I will never forget," said Elizabeth Gray, '08, of Ithaca, N.Y.